"lectures, workshops and panel discussions on sound art, sound design and the interdependence of aesthetics and technology"
Hamburg University of Applied Sciences and the Audio Engineering Society Hamburg Student Section are inviting to "klingt gut! / sounds good!" 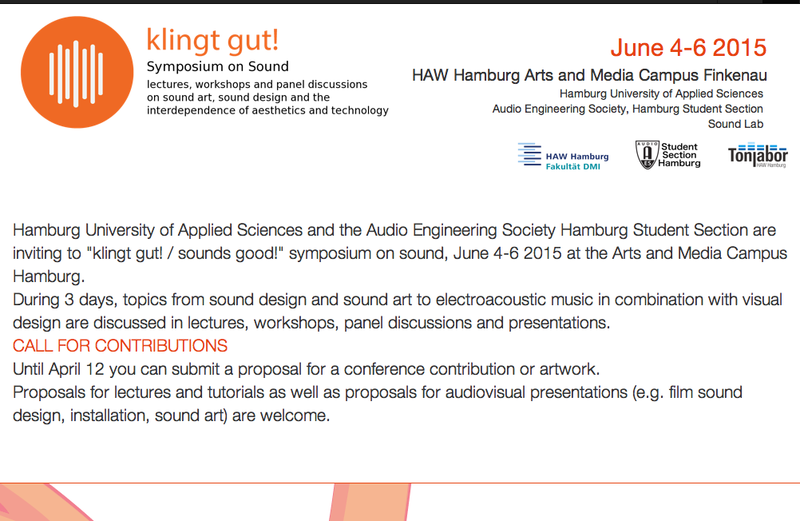 symposium on sound, June 4-6 2015 at the Arts and Media Campus Hamburg. During 3 days, topics from sound design and sound art to electroacoustic music in combination with visual design are discussed in lectures, workshops, panel discussions and presentations. Until April 12, 2015. Submissions for a proposal for a conference contribution or artwork, lectures and tutorials as well as proposals for audiovisual presentations (e.g. film sound design, installation, sound art�) are welcome.